William Easterling, who began a four-year appointment at the helm of the National Science Foundation’s Geosciences Directorate this summer, recently outlined how he plans to steer the organization through budgetary and political headwinds. William Easterling stepped down as dean of Penn State University’s College of Earth and Mineral Sciences to begin a four-year appointment as head of the National Science Foundation’s Geosciences Directorate (GEO) starting this June. Funded at $1.3 billion in fiscal year 2017, GEO supports a broad portfolio of research that spans the atmospheric, earth, ocean, and polar sciences. On Oct. 18, at the first meeting of GEO’s advisory committee since he took office, Easterling outlined his vision for the directorate and fielded questions about how GEO will invest in new initiatives in a challenging budgetary and political environment. 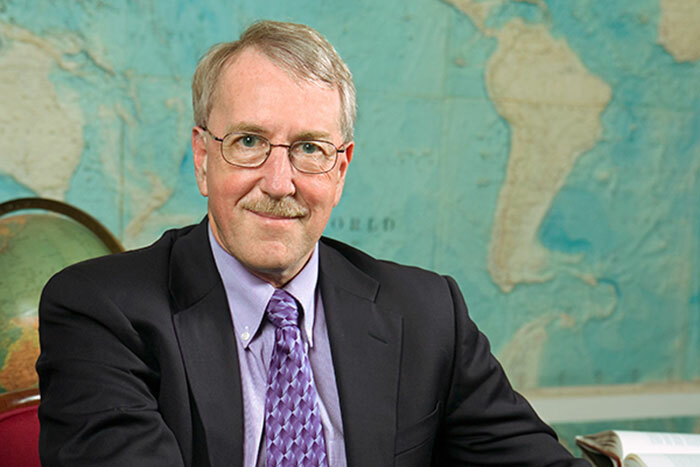 William Easterling, the new head of NSF's Geosciences Directorate. In his opening presentation, Easterling described his interpretation of NSF’s mission to support fundamental research. Noting that he was particularly influenced by the book Pasteur’s Quadrant, Easterling said GEO should maintain a balance between curiosity-driven inquiry and use-inspired research. “I think the directorate works in that way, but we always have to be mindful that we keep that sort of balance,” he remarked. He also stressed that GEO has to “take back our narrative of what the value of the geosciences is” and work harder at “convincing those particularly who are in power to provide resources for research that goes on in the directorate to better understand why it is important to fund the geosciences.” He noted that he is working with the American Geophysical Union on a project that aims to better communicate how breakthroughs in the field over the past 50 years have benefited society. I can’t imagine a world in which this directorate would make decisions on proposed research simply because it was politically unpalatable. One focus of the committee’s discussion was how GEO will be able to increase support for NSF’s “big ideas” at a time when the agency is facing the potential for budget cuts or flat funding. GEO is the lead directorate for the “Navigating the New Arctic” big idea, which is focused on better understanding the drivers and implications of the rapid warming in the region. As part of the initiative, NSF proposes to create a network of mobile and fixed observing platforms to monitor physical, biological, chemical, and social changes in the Arctic. GEO leaders also view the big ideas on convergence research, mid-scale research infrastructure, and harnessing data as particularly relevant to the directorate. They encouraged the committee members to raise awareness in the geosciences community about a request for information that NSF recently issued on mid-scale research infrastructure. Easterling said NSF Director France Córdova is “absolutely committed” to launching some big, forward-looking initiatives even in the current budget climate. “I will do what I can to protect core research programs, and yet I do think that we still need to put some investment in big, new ideas,” he added. However, Easterling also said that GEO’s funding for the Arctic big idea will have to be “much more modest” than what was initially envisioned, noting that NSF developed the ideas with the hope that it would receive additional money to support them. He also opened the door to the possibility that GEO could decide to not move forward with at least some of the ideas. “We proposed [the big ideas] back two years ago, and now this really is our time to either say we can’t do it, or we really want to put at least enough money into it to start a reasonable discussion of what we would do when funds are relatively more available,” he said. A separate thread of discussion at the meeting was why climate change research does not appear more prominently in the set of 10 big ideas. The advisory committee debated whether and how to raise this subject with Córdova, whom they were scheduled to meet with later in the day. “Let me just be perfectly honest,” Easterling replied, “the appetite of NSF right now is doing as little as it needs to to, you know, poke the bear, and yet stand by our scientific principles.” Instead of invoking climate change, which he said is “a polarizing icon, for better for worse — obviously for worse, from a scientist’s perspective,” the research can be framed in terms of the need to better understand the fundamental principles behind what happens when the atmosphere’s chemistry changes. Paul Shepson, director of GEO’s Atmospheric and Geospace Sciences Division, added that the big ideas were generated in a bottom-up way, and said that Córdova might turn the question around and ask why a climate science-focused initiative did not emerge as GEO’s top priority. “It’s not that climate change is a sensitive issue, it’s that the big ideas didn’t come from the director down,” he said. During their time with Córdova, the committee noted the importance of GEO’s climate science work and asked what she thinks the directorate could do to positively contribute to addressing the problem of climate change. In response, she pointed to NSF’s broad portfolio of research on environmental change. “We’re not going to diminish doing the very best research in all those different areas and that’s our commitment,” she said. “We are not a regulatory agency. We are not even a policy agency,” she added, and said she thinks most people would agree that it is important to continue researching these subjects.